Originally an Etruscan town, it acquired importance thanks to the neighbouring Via Franchigena. Federico Barbarossa, in 1154, received the ambassador of Pope Adrian IV here and this event is recalled in the “Festa del Barbarossa”, 3° Sunday of June. In 1167 it was seat of the Imperial Vicar. The Florence of Cosimo I de’ Medici purchased it in 1559. The Collegiata of SS. Quirico and Giuditta is in the Romanesque style: it has three portals and one whit faces southern is attributed toGiovanni Pisano. Inside is found the polyptych of Sano di Pietro and a Chorus from 1432-1502. Palazzo Chigi is from the XVII century. The “Horti Leonini”(16 th century) are one of the first examplesof of Italia Garden style: from August to October there is an exhibition of sculpture “Forms in green”. The Romanesque parish church of S. Maria Assunta was, perhaps, constructed on the remains of a pre- Cristian temple. The inside of the church of S. Francesco holds two wooden polychrome statues and a Robbia’s Madonna. The area of Bagno Vignoni was known about from roman times through the benefits of the waters from its spring which gush forth at temperatures of more 50°C. and are gathered in the big basin which lies at the centre of the town and gives it its evocative appearance. There is a small sanctuary dedicated to S. Caterina from Siena situated at the side of the basin. The castle of Vignoni looks down upon the town and can be roached either by S. Quirico or by Bagno Vignoni: a natural walk which can be made on foot. Montefollonico (576m above sea level) is a small medieval village whose raison d’être is found in the past rivalries between the republics of Siena and Florence; in fact the village was born as a Sienese fortress, against the “Florentine” Montepulciano. The first evidence of the area being inhabited dates as far back the Neanderthal man (approx. 60,000 years ago) with the Lithic tools found in the area of “Il Tondo” (now the public garden). In the following centuries we have accounts of a territorial dispute in the year 715 for the ownership of the church Pieve di San Valentino. 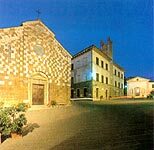 The history of the village as such began in the XIIIth century with the foundation of the church Pieve di S. Leonardo by the Cistercian monks from the monastery nearby, who by dedicating themselves to fulling wool gave the village its name Mons a Fullonica. After various events Montefollonico was incorporated into the Tuscan Grand Duchy in 1555. 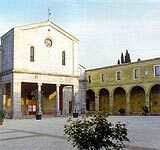 This is the largest Comune in the Sienese Valdichiana and contains six other villages: Abbadia di Montepulciano, Acquaviva, Gracciano, Montepulciano Stazione, S.Albino and Valiano. The poet Agnolo Ambrogini (known as “il Poliziano” from the Latin “mons Politianus”) was born here. The town is said to have been founded by the Etruscan king Porsenna and exhibits impressive architecture, mainly but not only Renaissance. Michelozzo, Baldassarre Peruzzi and Vignola all worked here, as did Antonio da Sangallo il Vecchio who designed the temple of San Biagio. Apart from the wonders of the historical centre of Montepulciano the tourist would do well to visit the spa centre at S.Albino. The local economy is based on agriculture and the town is famous for its Vino Nobile. In th summer the town hosts the “Cantiere Internazionale d’arte” and in the mid-Augut holidays the “Bruscello”, a traditional show spoken in rhyme, is performed on the Cathedral steps. On August 29 a wine barrel race, the “Bravìo”, is run between the different contrade, or districts, of the town and there is a procession in 13th-century dress. This former medieval hamlet, residence of the Cacciaconti family until the 1500s, stands on the top of a hill, deep in unspoilt countryside of woods, vineyards and olive groves. A third of the village is occupied by the Cacciaconti castle and its annexes including an impressive ornamental garden. Here you can visit the church of SS. Pietro and Andrea which contains a fresco by Sodoma. The mild climate, the relaxing countryside and the gastronomic attractions (wine, oil, cheese, salami, honey and local “chianina” beef) make the area a popular destination for agritourism. The town hall buildings in Petroio house the “terracotta association” and the terracotta museum is now being prepared. The pottery or “coccio”, produced by the local manufactures is famous throughout Italy. Castelmuzio stands on a outcrop of tufa close to the monastery of S. Anna in Camprena which contains remarkable frescos by Sodoma; the parish church of S.Stefano is also nearby. This spa town, which specialises in the treatment of liver disorders, is among the most famous in Italy. The special properties of the waters of Chianciano is not far from the spa centre with its hotels, shops, treatment centres and elegant parks where the therapeutic waters emerge: “acqua Sillene” is used for balnotherapy and mud-bath treatment; acqua Sant’Elena” used for the treatment of the kidneys and urinary disorders. Both the climate and the unspoilt green areas are excellentr, holidays here are fulfilling and pleasant and dedicated to health and fitness. More than 2 million people visit Chianciano every year. Cultural attractions include the Museo Etrusco, soon to be opened, and the Museo della Collegiata. Also to be seen are the collegiate church of S.Giovanni Battista, built in 1229 and restored in 1809, the church of the Compagnia (1517), the Torre dell’Orologio with Medici crest and the church of Madonna della Rosa (1585) designed by B. Lanci. Without doubt, Montalcino lives a life of many souls. Montalcino as the birthplace of Brunello wine, whic someone once defined as the best and most renowned wine in Italy. From the height of its 564 m. the ancient town dominates the surrounding countryside, clinging to the slopes of a hill crowned by the imposing 14th-century fortress. In the labyrinth of little streets, amongst artisans’shops, small cafès and places selling typical local produce ( besides the wine, their honey and locally-made biscuits called “dead bones” are also well-known) the sights worth seeing are the fine Town Hall, the Bishp’s Palace ( housing the United Civic, Diocesan and Archaeological Museums, with works by important 13th-16th century Sienese artists, such as Bartolo di Fredi, Il Sodoma, Bartolomeo Neroni), the antique Crucifix of Saint Antimus dating back to the mid-12th century, and the churches of Saint Augustine, Saint Giles and Saint Francis, all built between the 13th and 14th centuries, as well as the Sanctuary of our Lady of Succour. But it is just a little way out of town, near Castelnuovo dell’Abate in the Starcia valley that thhe heart of Montalcino spirituality is to be found:the Romanesque abbey of St.Antimus, a striking little temple enveloped in an almost magical atmosphere, founded by Charlemagne in 781. Finally, there are several castles on Montalcino land: the one worthy of mention is Poggio alle Mura, which has Longobard origins. In Etruscan times, on the southern edge of the Valdichiana, stood the town of Chamars, powerful enough, in that period, to defeat Rome. In the historical centre, with its medieval architecture as well as styles of the granduchy, remains of the Roman structure can still be seen which were built on top of yhe pre-existing etruscan town. The Museo archeologico nazionale contains excellent Etruscan finds and Greek ceramics from the contryside around Chiusi; the funeral urns and sarcophagi are particularly interesting. It is possible to visit the catacombs and Etruscan necropolises; the tomba del Leone (6th century b.C.) and the tomba della Pellegrina (5th century b.C.) are open. Definitely worth visiting are the Museo della Cattedrale and the “labirinto di Porsenna”, underground water passages built by the Etruscan and including a large cistern which leads to the romanic cathedral bell tower. There are four neighbouring localities: Macciano, Montallese, Montevenere and Querce al Pino. Festivals: The festival of Santa Mustiola with its palio delle Torri and the September wine festival. The main feature of this medieval town, which stands on the Sienese border between the regions of Umbria and Lazio, is its wealth of hot spring water, numbering as many as 42 springs. The waters here were already known in Roman times (Oratius alludes to their therapeutic qualities). The main economic activity is related to hot springwater tourism and to “agritourism” which thrives thanks to the unspoilt woods and countryside. Today, a new building stands next to the former spa centre where it is possible to have a variety of mud and water treatments. In the near vicinity the swimming pool is filled with hot spring water at 40°C. It is worth visiting the fairy-tale castle of Fighine. Traditional festivals include: the “Sagra dei Pici” – a homemade pasta speciality – in Celle sul Rigo, a village built on the site of a former fortress. The festival is held on the last Sunday in May. In San Casciano the “Sagra del Ciaffagnone” takes place on the first Sunday in June. The other frazione of Palazzone is wellknows for its wine festival and its strong Chianti Colli Senesi wine.